Homes and Interiors Businesses In Oban and North Argyll. Argyll Furniture Store s a local, family run business that has been serving Argyll and the Highlands for 20 years. Large selection of stock to suit all tastes. Using state-of-the-art software, Argyll Kitchens offers clients designer kitchen and bathroom services covering joinery, plumbing, electrics, tiling and decoration. Professional and experienced service, working in the Oban and Argyll area for many years. Call for a free quote on all aspects of decorating,internal and external. 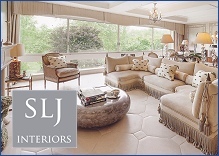 Based in Duror of Appin, Jane works with private clients or in association with architects and builders, to design, specify and supply all interior requirements. Mathesons Furnishings is a local family run store supplying quality furnishings for the home, guesthouse, self catering establishment, hotel or castle. Customers are invited to come and brose the showroom at their leisure in a relaxing and welcoming atmosphere. Sylvia Lawson Johnston and her partner have a showroom and studio space in Oban displaying an extensive library of fabrics and wallcoverings. Please also see our 'Tradesmen' section to contact many skilled tradesmen to assist with your home improvement and interior design projects.